Today may be the day to break my winter cycling hibernation. I was out for a run yesterday and had a chance to assess some of the paved and dirt trails. There are enough good ones to give it a go and with a high of 12C forecast for this afternoon the only thing standing in my way is getting the bike ready. 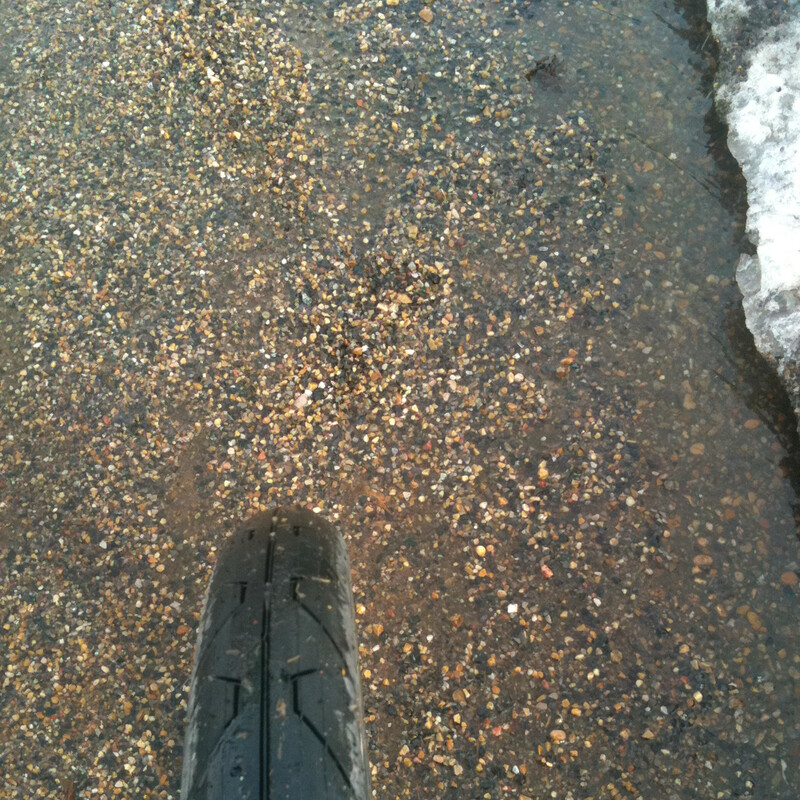 This is what has held me off so far more than the road/trail conditions. I will need to clean and lube my chain which even with the ease of modern products tend to put me into procrastination mode. 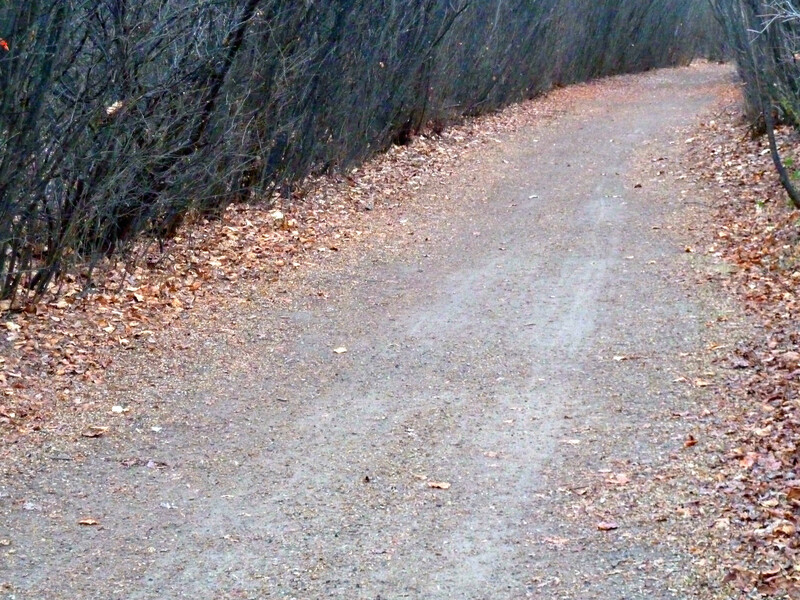 While the sun-exposed north bank of the river valley is nicely dried, shaded areas such as Kinnaird Ravine, up from the east end of Dawson Park are ugly. I had trouble walking here a day earlier and wouldn’t chance it on two wheels. Enjoy your ride – maybe I’ll see you on the trails and road. The only problem with riding at this time of year is that by mid-afternoon when it is warmest, the sun is already on its way down in the southwest sky making it difficult to see. There were not a lot of cyclists out on this November afternoon, but I did see a few. While the paths were for the most part very dry and clean one does need to keep there eyes open for the occasional ice patch. Contrasting the icy river with the nice clean bike path. I post these images mainly for the benefit of anyone who is not familiar with Edmonton and thinking that surely no one could be cycling that far north in November. Sure this is turning out to be an exceptional month but it shows that cycling is possible and the river valley beautiful enough to make the effort worthwhile. Me – to prove I really was out there on Nov 22nd 2015. It has been 8 weeks today since my last ride. I am still fondly remembering that trail ride through Edmonton’s river valley and starting to wonder when I might next get out on two wheels. 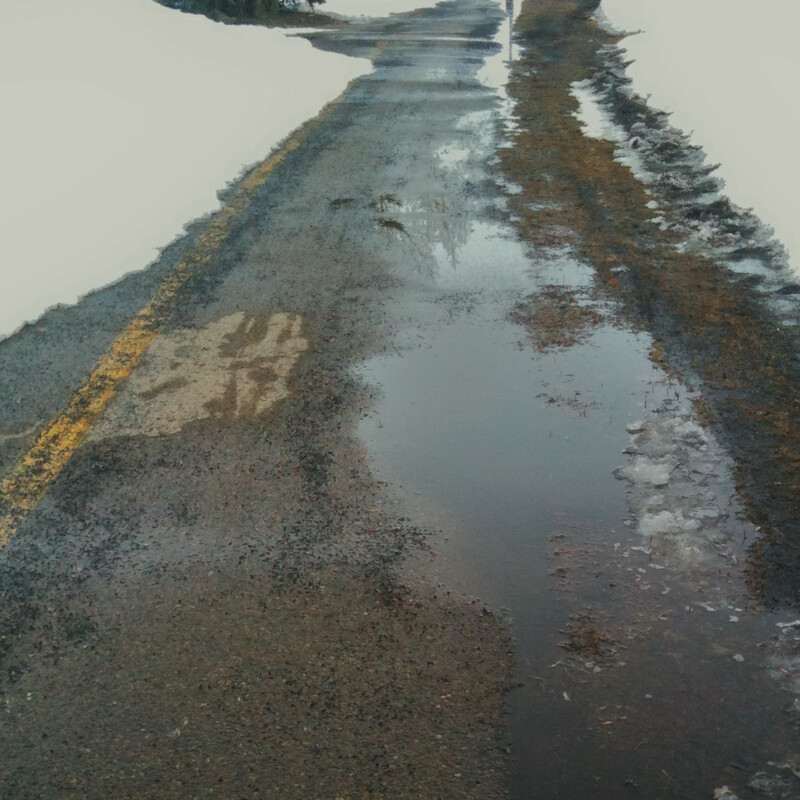 It is probably going to be another 10 weeks before the streets and paved trails are passable and another 4 weeks after that before I want to tackle the dirt trails. So what to do till then? One option is of course to just damn the torpedoes and keep on riding. I was thinking again this year of getting a studded tire or two for my mountain bike and continuing to ride the trails. I certainly see other people around town doing that and I do have admiration for them. 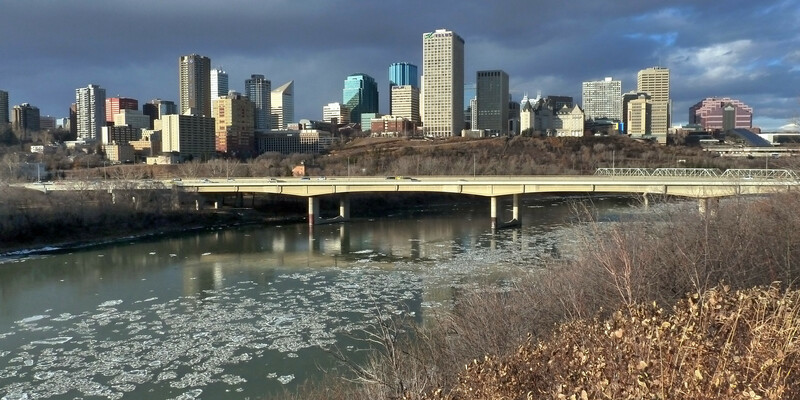 With the winter that we’ve had in Edmonton so far, the temperature certainly wouldn’t have been an issue for riding but there is a lot of ice on the paths and I am not a fan of ice. The second option (and again one I seem to think about every winter) is to get an indoor trainer and ride in my basement. I spent a lot of time last year comparing the various trainers but I never did figure out what would be the best choice for me and missed out on picking one up last spring at an end of season clearance price. I worry a little bit about the boredom of riding indoors but if I can mix it up with a little outdoor activity I could probably get my legs and lungs in decent shape to hit the roads in April. My third option is cross training – turning to other activities (running, snowshoeing and cross-country skiing) and this is probably what I will do. I’ve started off the year with some regular outdoor running (including a run in shorts on January 4th to take advantage of a very unseasonable temperature of +11). 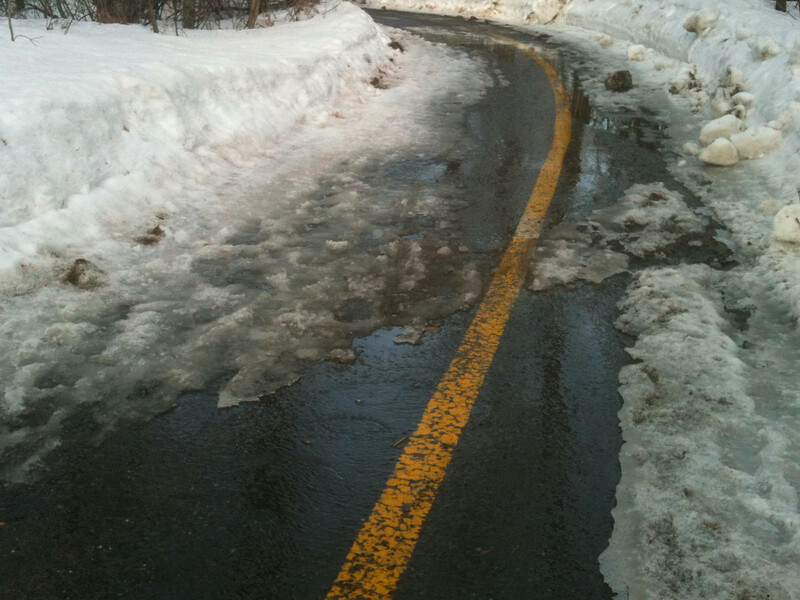 The river valley trails have been plowed which despite best intentions means they are icy. Careful attention to where one steps is required. I find this really detracts from the meditative effect of running that I so enjoy on dry trails but nonetheless it is great to be out in the fresh air (and frequently the winter sunshine). I am looking forward to a return to more average winter conditions and especially to more snow to cover the icy ground, so that I can get out my skis and snowshoes. So what are other Edmonton cyclists and outdoor enthusiasts doing to keep active through this winter? I went out for my first winter run for the season. 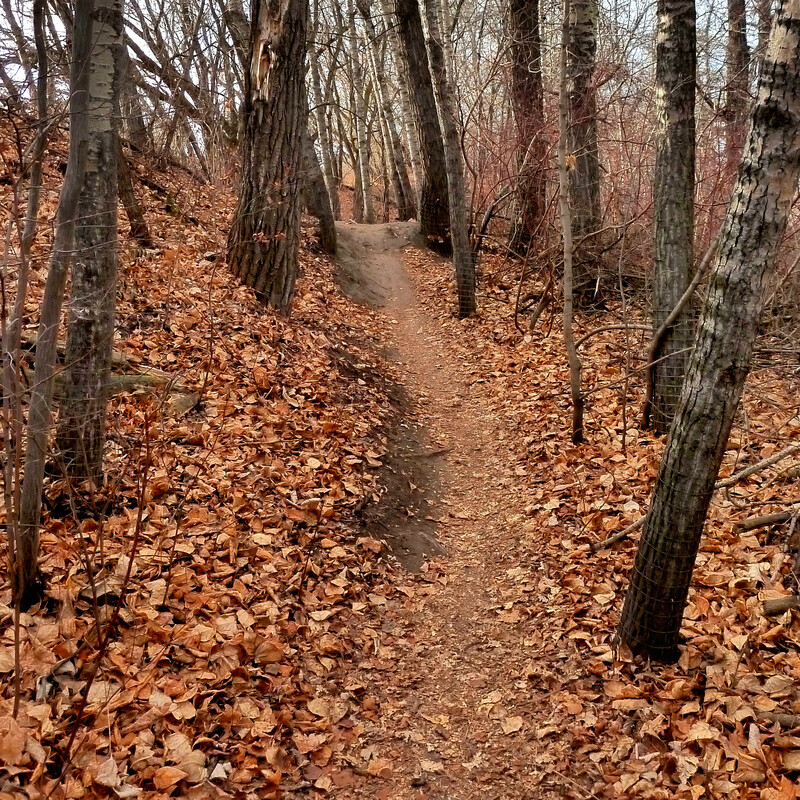 It is hard to believe that it it nearly 4 weeks already since I last had the bike out on the trails of Edmonton’s river valley. On the one hand it feels as if that ride were just days ago – on the other hand it seems like a distant memory. 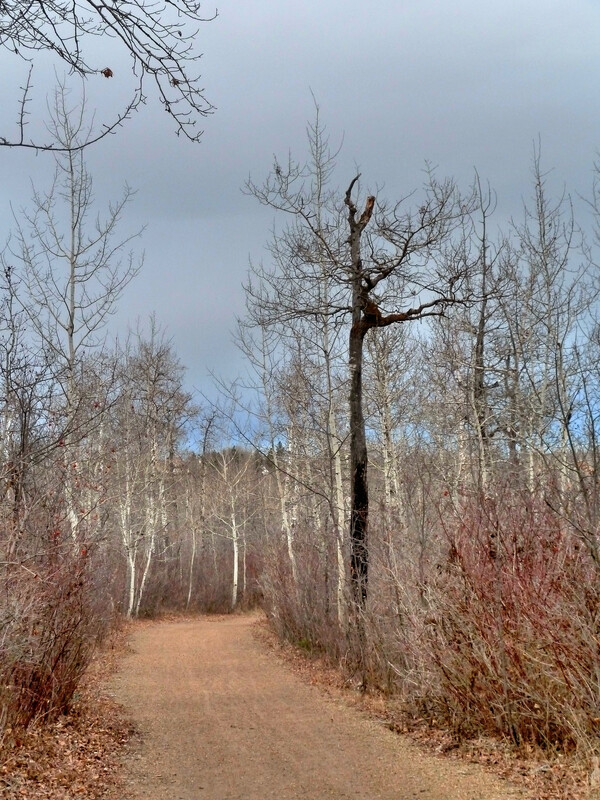 Today’s run was decent weather wise – a degree or two above freezing, and overcast as I set out shortly after noon. There was a bit of a breeze and even some blowing snow near the end of the run but it was refreshing. I certainly don’t mind winter running as long as I am dressed appropriately – not too lightly or heavily. 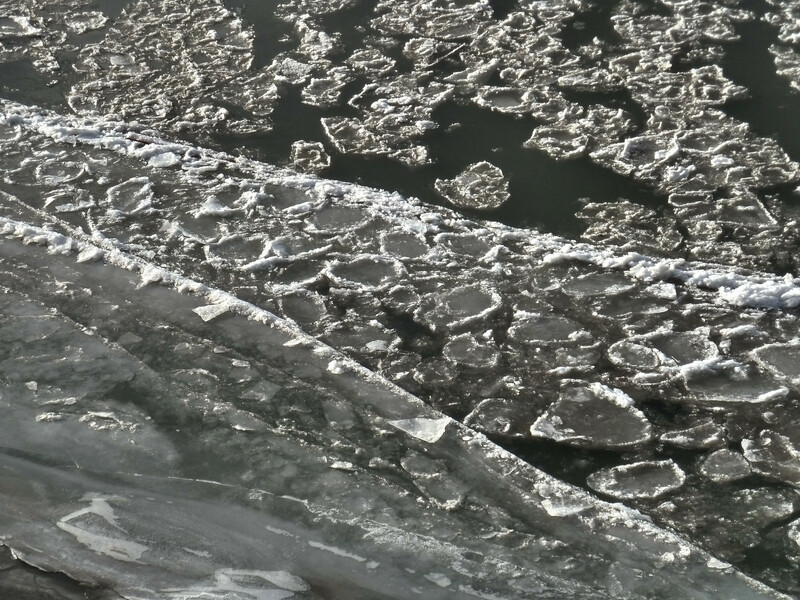 The one thing I hate about winter running and it certainly came into play today is the ice! Ice takes the fun out of running for me. Instead of gliding around on autopilot in a meditative state it seems as If my full attention must be directed at the act of running, picking out a safe spot for each footfall and being prepared to correct when I do accidentally or unavoidably hit a slippery spot. 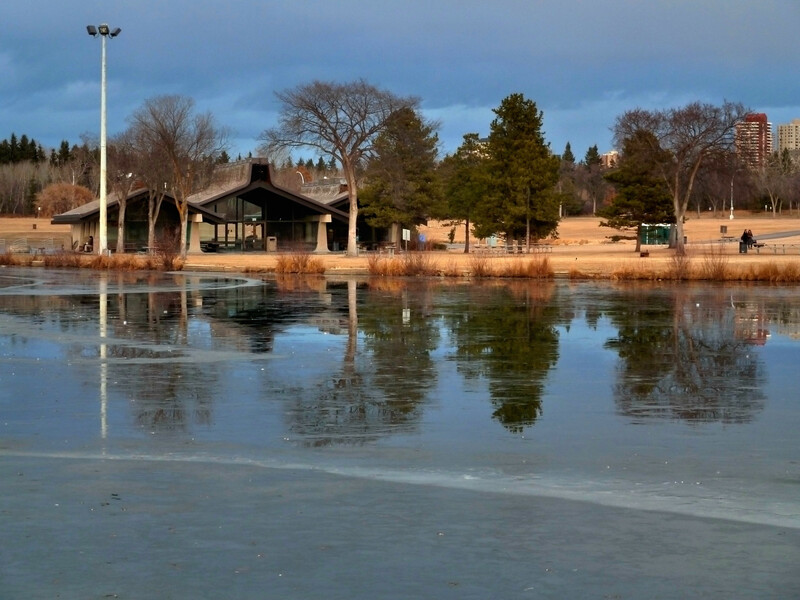 With a bit of a warming trend in recent days, the snow surface had melted down and refroze. 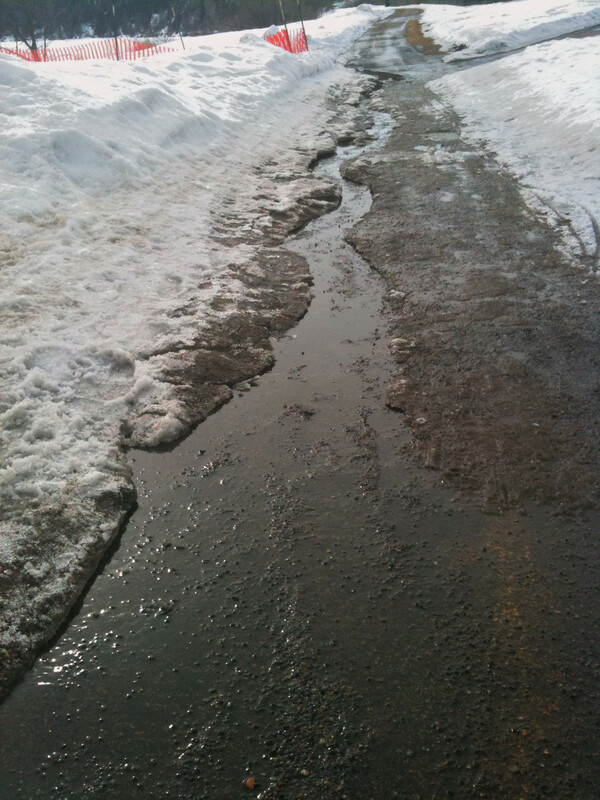 I found both the snow/ice covered paved trails and the dirt trails equally treacherous. 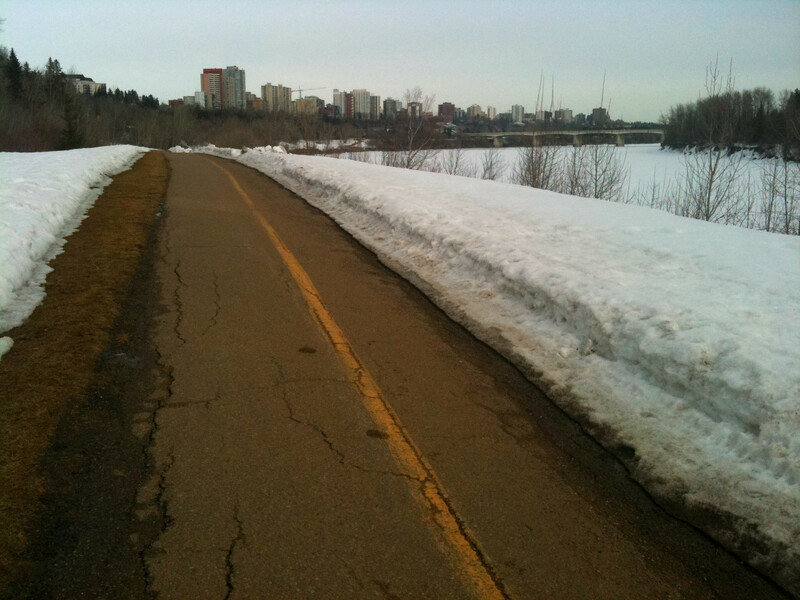 Some sections of the trail (Downtown Edmonton between the Grierson-Cloverdale footbridge and Walterdale Bridge) weren’t too bad (for example, the wooden bridge deck itself) but it seemed anywhere there was even a bit of a slope, there was also an icy trail – a most unwelcome combination. Nonetheless, I did make it safely around my loop (approximately 8K) and didn’t feel to bad. I even started thinking about getting serious about the running this winter with the goal of a marathon in 2012 (but no decisions yet). Also making today run enjoyable was the music that accompanied me. I was listening to the recently released Kate Bush album, “50 Words for Snow” . It was soothing and seemed very appropriate for a cool, grey day with a light snow falling. 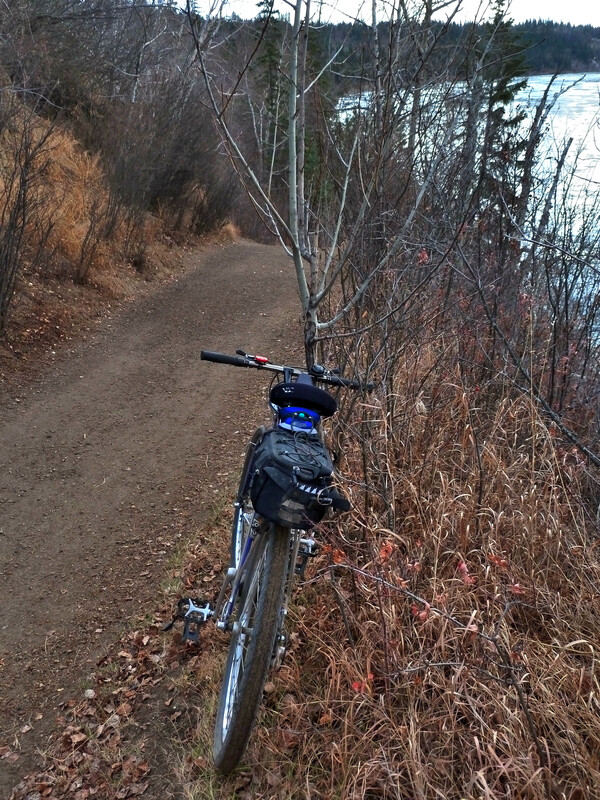 It doesn’t seem right; it is certainly unexpected – to be having such a good time on the bike in November (in Edmonton). Nonetheless, I was out on my mountain bike again today (2011 November 10) and came home – much later and happier than I expected. I started out from central Edmonton around 2 in the afternoon, heading along the south side of the river trails (dirt ones as much as I could). 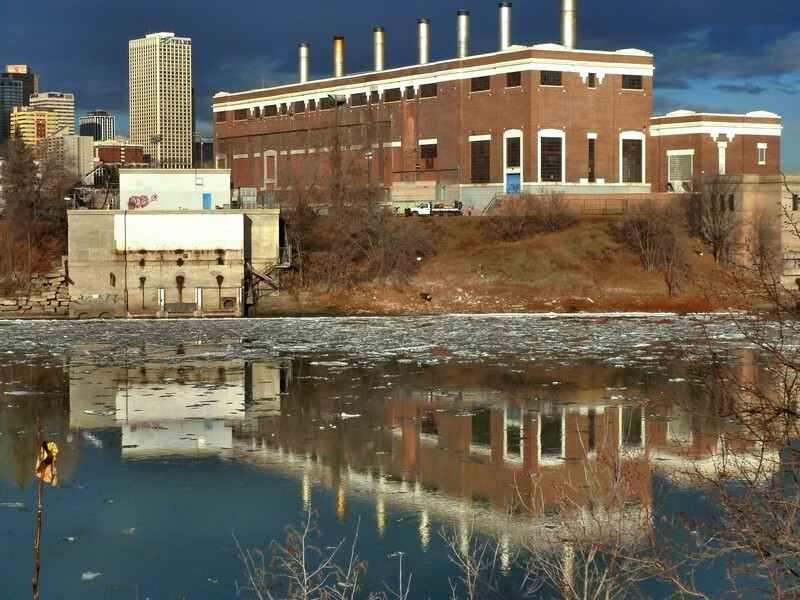 I headed under the Walterdale bridge then along a winding little single track to the High Level Bridge. 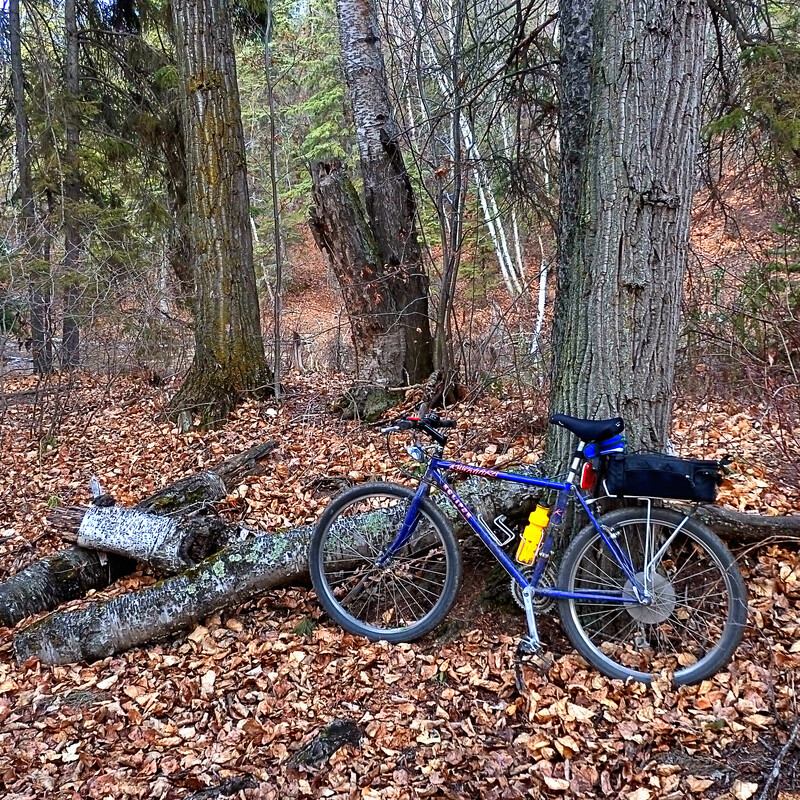 That was a fun little trail of a type (narrow, hilly and amongst the trees) that I don’t often ride. 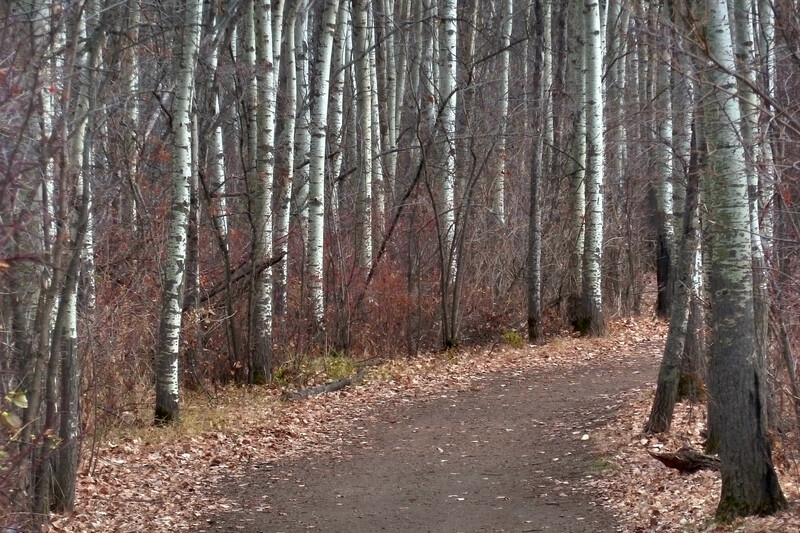 and then along through the wooded trails west of Kinsmen Park, up and down a hill and then along the riverside trail to Emily Murphy Park. 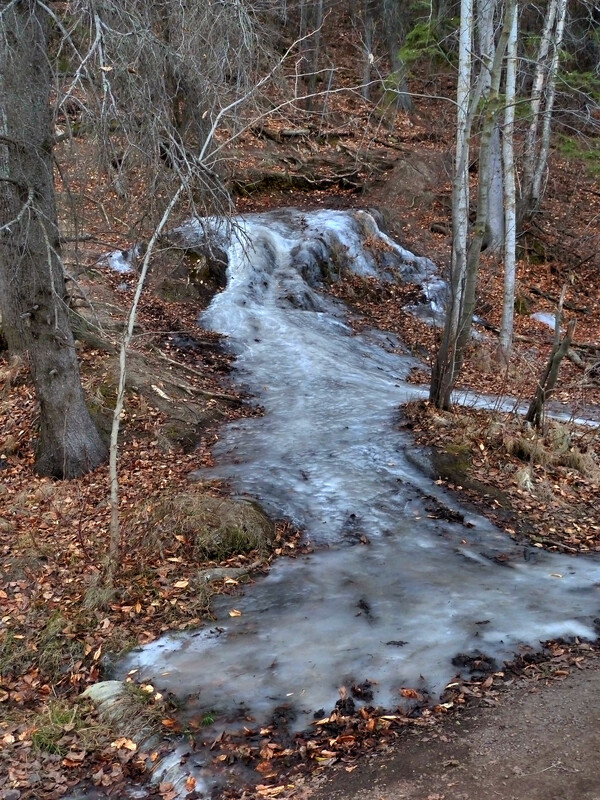 There were a few places along the trail where water running off the riverbank has already frozen. This one did not freeze on the path but a couple of other places, the trail was covered in ice for a 5 meter stretch. As I stopped to take that last photo I was approached by a photographer from the Edmonton Sun newspaper who had apparently captured me riding a nd wanting to get my name. He was also interested in my little rearview mirror and took photos of that too. I may end up being in the paper. 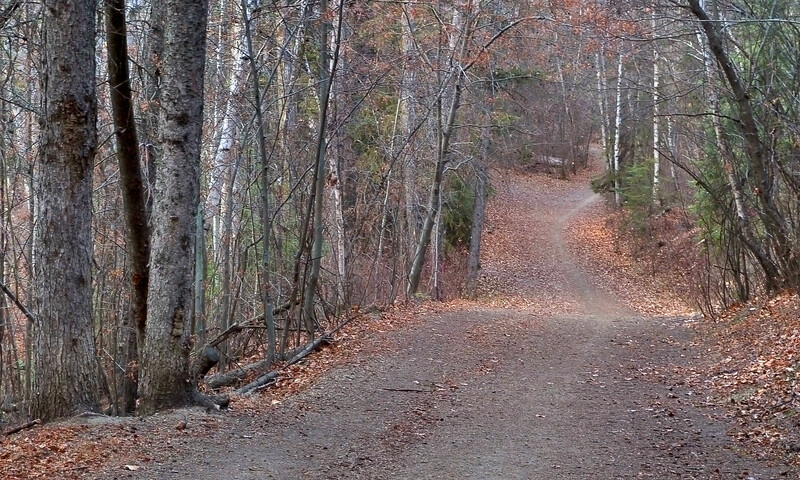 From Hawrelak Park I continued along the dirt trail on the east side of the river all of the way up to Keillor Road. The trail has a few good hills. I stopped frequently to take photos and even parked the bike a few times for that purpose. Along the trail. 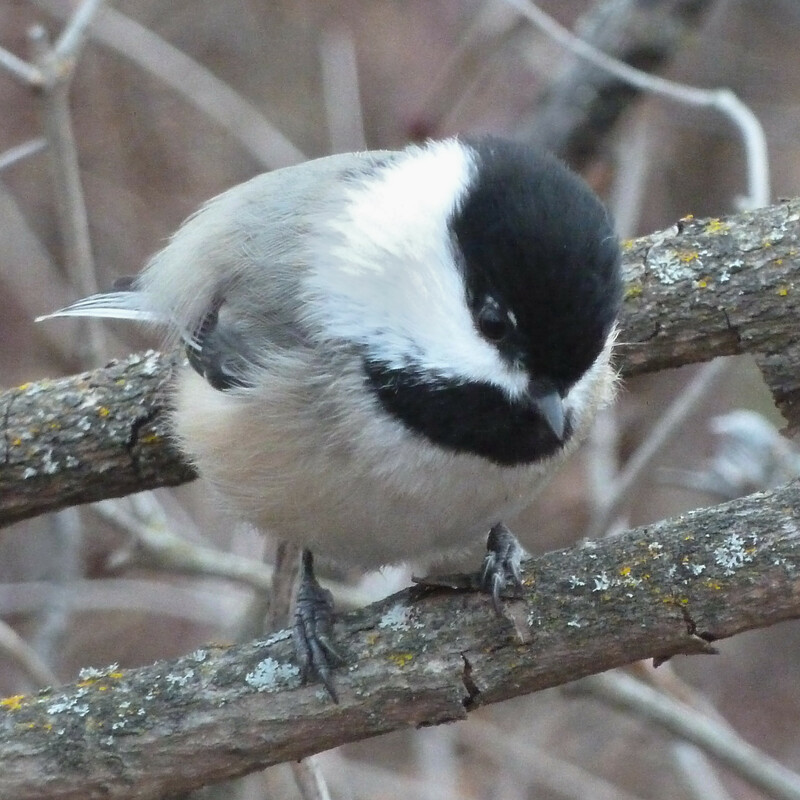 I stopped to take the photo above but then was entertained for a few minutes by little chickadees flitting about me and landing on the branches just beyond my reach. As I had been moving so slow, it was getting late (approaching 4 pm) and at this time of year dusk was not far off so I was trying to make up time which meant crusiing along the flat wide trails. Back on the trail between Emily Murphy and Kinsmen.I again encountered the ice across the path and had to sloe down – in fact for one of the patches I chose to just walk across the ice. 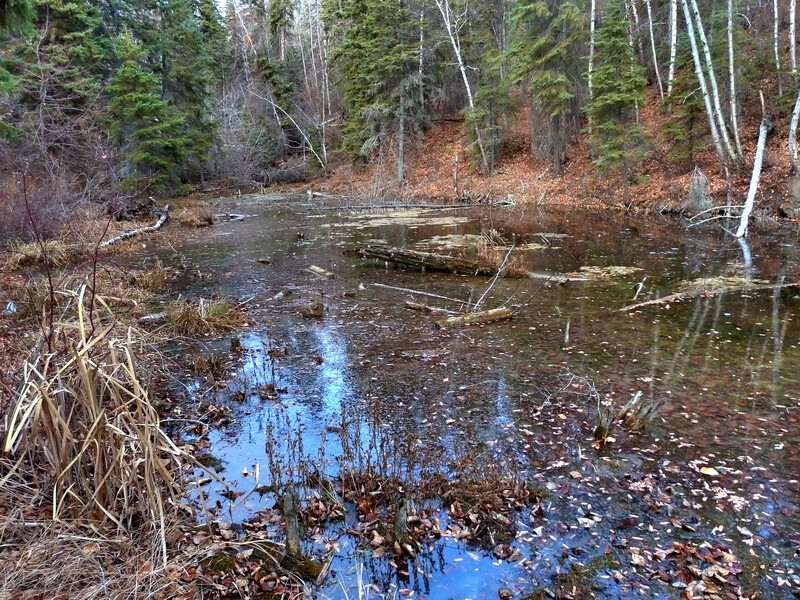 Just a week ago, the first weekend of spring 2011, I was out cross-country skiing here in Edmonton’s river valley. The snow was great, the temperatures winter-like and the prospects of getting out on the bike anytime soon seemed remote. However what a difference a week can make, especially a few days when the sun shines and the temperatures rises to seasonal highs of around +8. Don’t get me wrong, there is still lots of snow on the ground and I’m sure the skiing would still have been great today but something inside me changed this week and it had to be two wheels not two “boards”. I kept my expectations moderate for today. I would have been happy to just get in a 15 minute ride. As it turns out I was out for at least an hour and covered 16K – with many stops to take photos. 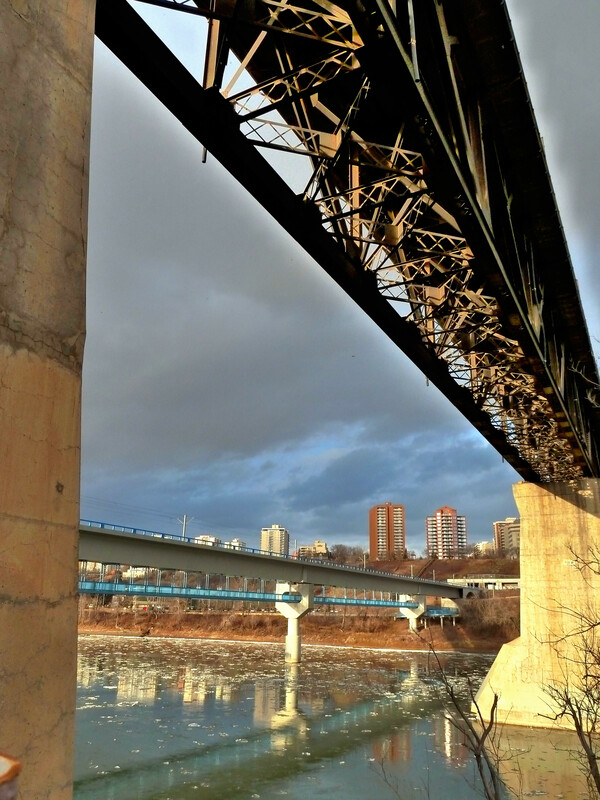 I stuck to the paved paths on the north side of Edmonton’s river valley trail system from Riverdale to the base of McKinnon Ravine. It was mostly sunny so I was surprised to learn that the temperature at the time was only +3C. I guess I was properly dressed wearing a couple of layers plus a Gortex jacket. 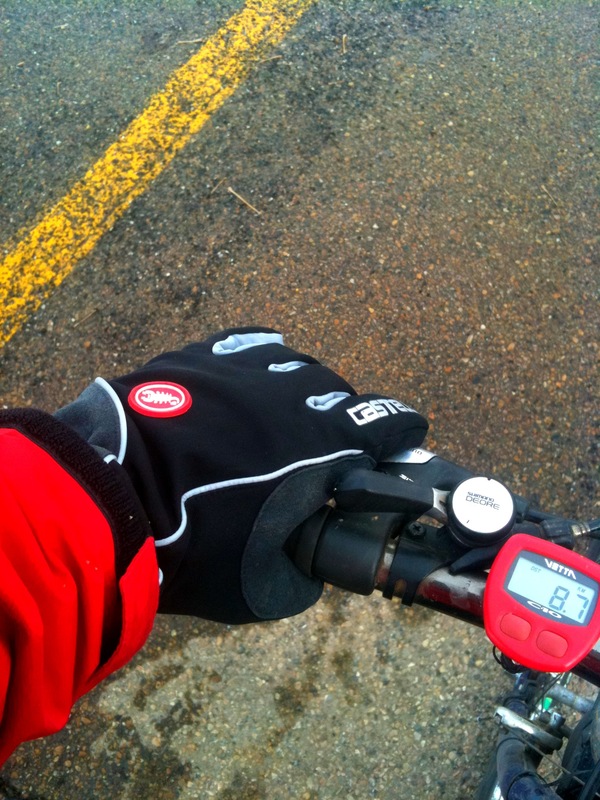 I had a head cover under my helmet and was wearing full-finger winter cycling gloves. The only part which was a little cool by the end was my feet as I was wearing just a single pair of socks inside my regular cycling shoes (the same as I would wear in summer). 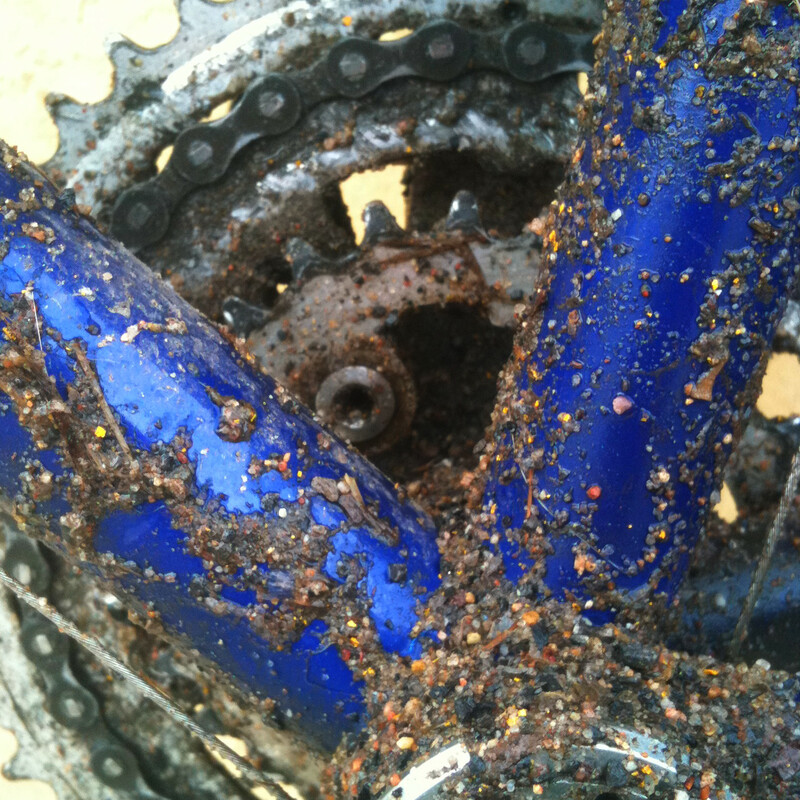 I knew it would be messy so I rode my “mountain” bike. 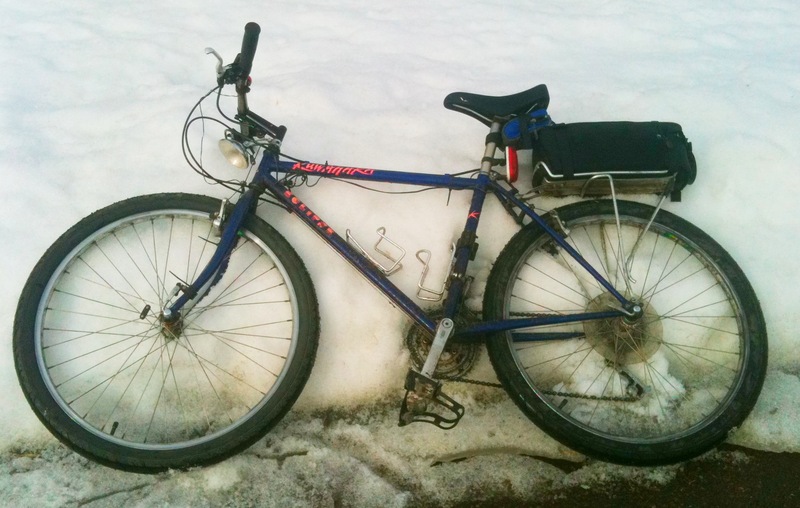 Last year I had replaced my knobby tires with some relatively smooth road tires so I was a little concerned that I might have trouble on the trails, especially if I encountered patches of snow. It turns out my tires were fine. There were a few patches of snow and ice but I was able to get by these obstacles without incident. The key to riding the trails today (and I expect it will be for a couple of weeks at least) is to take it easy. It is more an exercise in technical riding than technically riding for exercise. It is more brain and fine motor skills than a strong cardio-vascular endeavor. This is just as well for me, at this point of the season. So what was it like on the trails? Pretty much like I expected – the first two descriptors that apply are wet and sandy! 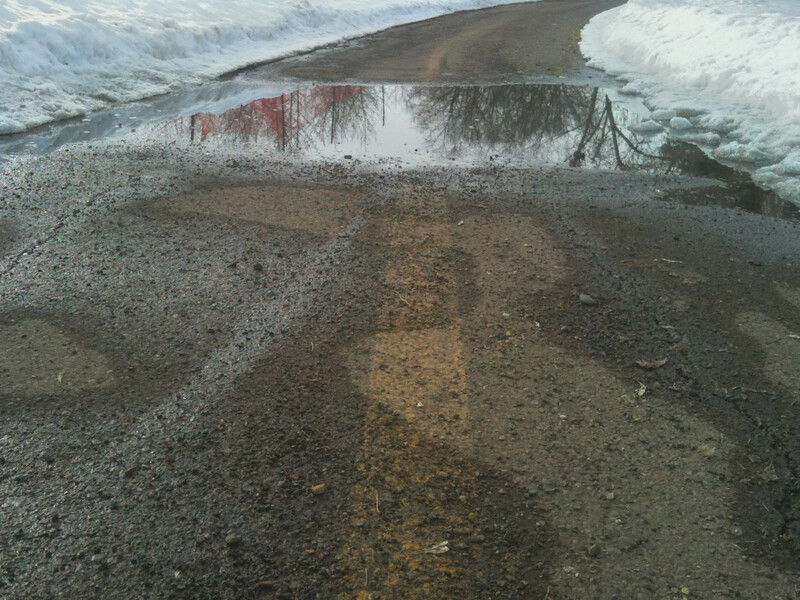 There were only a couple of stretches where there were puddles right across the trail. Most of the time there was a clear path although not necessarily both lanes. 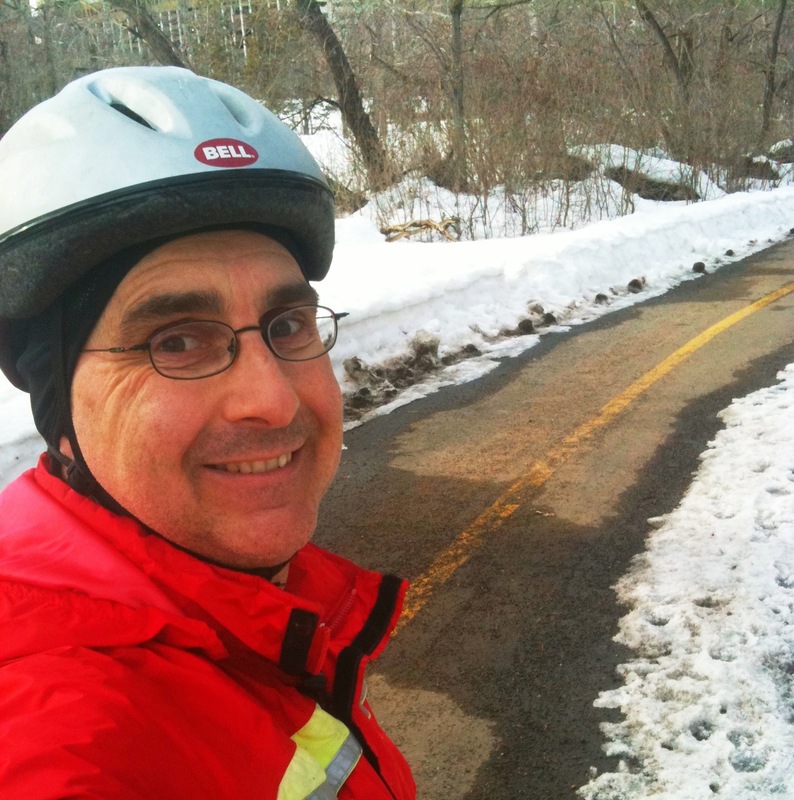 Most of the trails I was on today had been plowed during the winter and I rode the trails on the north side of the river which have been exposed to the sun, leading to rapid melting of what snow had been left on the trail. There were a couple of sheltered areas where there was slushy snow across most of the trail. 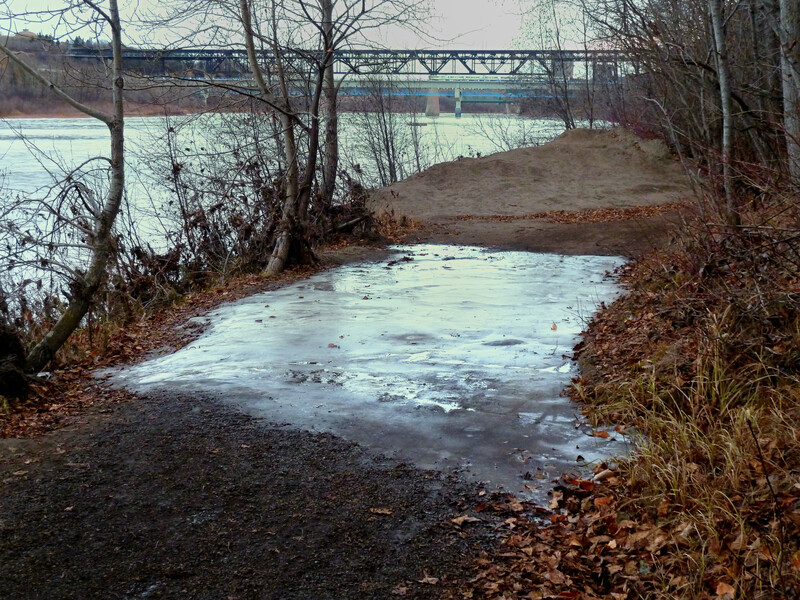 The greatest hazard I noted was ice on the sloping trail under the Low Level Bridge (the north side of the west end of the bridge). Although the trails were not ideal there was not much traffic on the trails which made it easy to move from side to side to choose a safe path. I did encounter few cyclists and a number of walkers and runner. I found myself going very slowly around the others so as not to spray them with water or sand. Yes, there is some cleaning and probably some re-lubing to do which isn’t particularly fun, but overall it was sure wonderful being out cycling again. It is comforting to know that things (weather and trail conditions) can only get better for the next 4 or 5 months.